BRB rewriting our menu for every day this week. 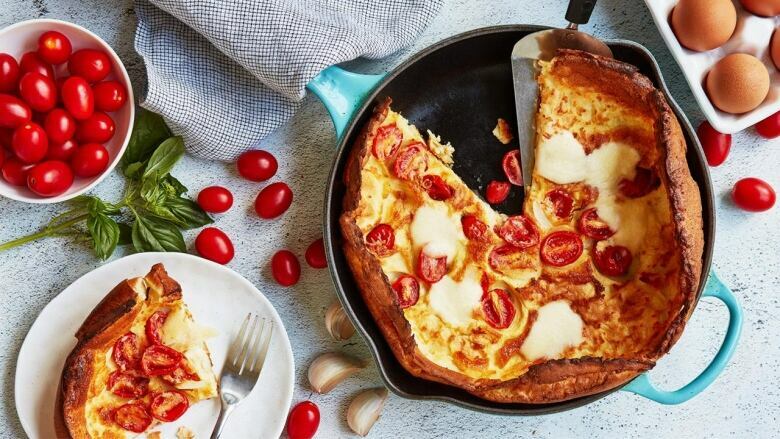 When recipe writer, Josie Malevich, told us that this one-pan wonder is “perfect for brunch or a quick supper” she followed by calling it a sort of “pizza pancake that’s fun to make and serve.” She might have said things after that — all we could think about was making this tonight so we didn’t hear much else. You can keep this vegetarian, as suggested here, but we won’t fault you for picking up some pepperoni on the way home either. Note: Serve with a sprinkle of baby arugula over top, and a few slices of prosciutto if you like. Preheat oven to 425F degrees convection or 450F degrees standard. Heat a 9 or 10-inch cast iron skillet in the oven for about 8 to 10 minutes. In blender, mix together the milk, flour, eggs, sugar and salt until smooth. Add butter to the hot pan, then transfer it back to oven until the butter is melted, about 30 to 60 seconds. Working quickly, pour the batter into pan, sprinkle grape tomatoes and garlic over top and return immediately to the oven. Bake until the pancake is puffed and golden, about 15 minutes. Top with the mozzarella and bake again until the cheese melts, about 2 to 3 minutes. Sprinkle with basil leaves and serve.